The Olympic Games always attract big-named brands as partners. And these partners make the most of the games to push their brand messaging. 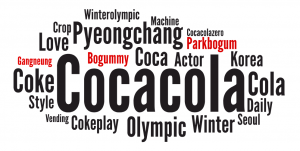 But how successful were these brands at creating a social media buzz during this year’s Olympic Winter Games? 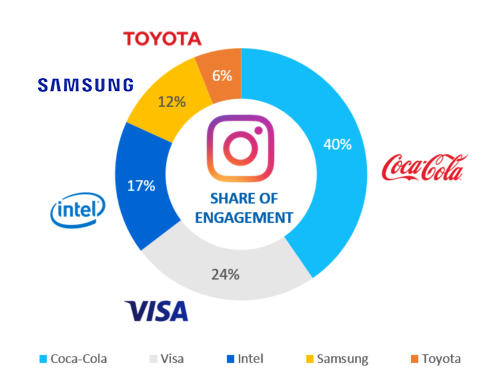 Our social insights team evaluated the social success of some of the Olympics’ top partners: Coca-Cola, Samsung, Intel, Toyota and Visa. We focused on Instagram, where we carried out a deep listening and influence analysis. We collected and analyzed almost 3,000 Instagram posts created between 1 January and 26 February 2018. These included both user-generated and paid-for influencer posts relating to any of the five partners in the context of the Olympics. We looked at how many people were talking about these brands, who was driving the conversation, and how far their content engaged the Instagram community. Based on this information, we determined each brand’s share of voice (number of posts) and share of engagement (number of interactions on these posts). We also highlighted some of their most influential posts and popular topics of conversation. 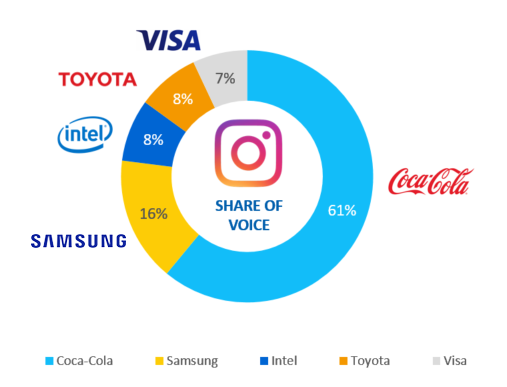 The two brands with the largest number of Instagram posts (Coca-Cola and Samsung) enjoyed more than three quarters of the share of voice (77%). However, they shared just half of the total number of engagements (52%). Meanwhile, Visa and Intel appear to have made cleverer use of marketing activations to steal a large proportion of the engagement (41%) with fewer posts (15%). Among the five brands we investigated, Coca-Cola came out on top on Instagram. Unsurprisingly for this prominent and well-known brand, it secured the highest share of voice (61%) and engagement (40%). Some of the most influential posts for Coca-Cola on Instagram came from paid influencers, such as vlogger Monica Church. Olympic athletes, including ice hockey player Noora Raty, also engaged hundreds of users. While one of the most talked-about topics was South Korean actor Park Bo-gum, an endorser for Coca-Cola. Visa generated the smallest number of Instagram posts among the five brands we investigated. However, even with its low share of voice, the enthusiasm around Visa was particularly strong. Its share of engagement was more than three times its share of voice (24% and 7% respectively), the second highest among the five brands. 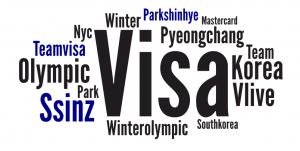 Visa’s marketing efforts included using its Team Visa athletes’ own social media channels and featuring a South Korean model. Much of the conversation on Instagram centered around Visa’s Korean model, the actress Park Shin Hye. The brand’s paid partnership with the US ski racer Mikaela Shiffrin also generated thousands of interactions. A big surprise during the game was Intel and its focus on technology. Its record-breaking drone light show broadcasted during the opening ceremony, as well as its VR streaming of the games delivered animated discussions about innovation. This is reflected in Intel’s share of engagement which doubled its share of voice (17% and 8% respectively). 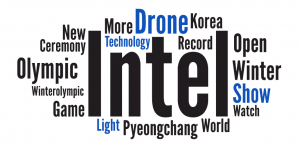 The most mentioned topic was, of course, Intel’s opening ceremony drone show. Imagery and videos from the show were shared by a wide range of Instagram accounts with big followings, such as Instagrafite and alexanderjohnsonofficial. 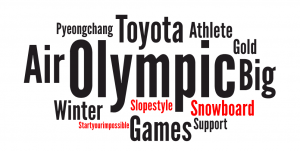 Toyota’s share of voice (8%) and engagement (6%) were low compared to the other four Olympic partners. Nevertheless, its campaign hashtag #Startyourimpossible was a popular topic of conversation among its Instagram posts. Speed skater and Toyota ambassador Ireen Wüst helped to promote this message. Although it received a good share of voice (16%), Samsung’s share of engagement was one of the lowest (12%) on Instagram. The biggest topic of conversation was the Samsung Note 8 and its camera features. 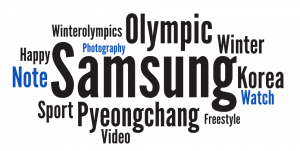 Instagrammers also talked about watching the Olympics via a Samsung device. Measuring posts and engagement on social media is just a small fraction of what we do at MetrixLab. Our social insights team can search all publicly available user-generated content from across the web. This includes blogs, forums, social media platforms and review sites. We then analyze and classify the data based on your search objectives. We help you make sense of all this data, and provide insights and action points on how to optimize your brand’s marketing efforts accordingly. Let us show you what we can do for your brand. Contact us to start a conversation.